In the wake of a No Deal Brexit we’d need to ink trade deals with various nations – but would Britons prefer to squeeze allies for the best deal, or instead strike a mutually beneficial compromise? Should MPs fail to back a Brexit deal the matter of settling a trade agreement with the United States will be a very pressing matter indeed. 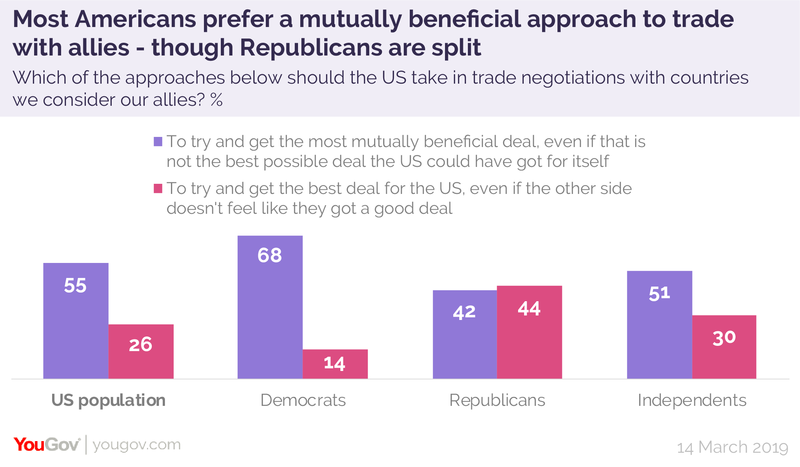 Fortunately for Britain, a recent YouGov US survey found that most Americans (55%) favour an approach to trade with allies that seeks mutual benefit, rather than one which seeks to extract maximum gain from their trading partners. Of course, the fact that it is the preferred approach of the American public may have little bearing on Trump’s personal approach to trade deals, which are more combative than any of his predecessors – and Republicans themselves are evenly split (42% to 44% respectively) on whether a one-sided or two-sided trading relationship is better. But how would the British public want their own government to proceed when negotiating with friendly nations? As with America, the more favoured option is the mutually beneficial one, but to a lesser extent – 44% of Britons prefer this stance, while one third (35%) would rather try and maximise our own gain, even if this alienated allies. As with the Republicans, Conservative voters are evenly split, with 43% on either side of the divide. And those who backed Brexit are actually more likely to prefer trying to squeeze our trading partners as hard as possible, by 48% to 36%. 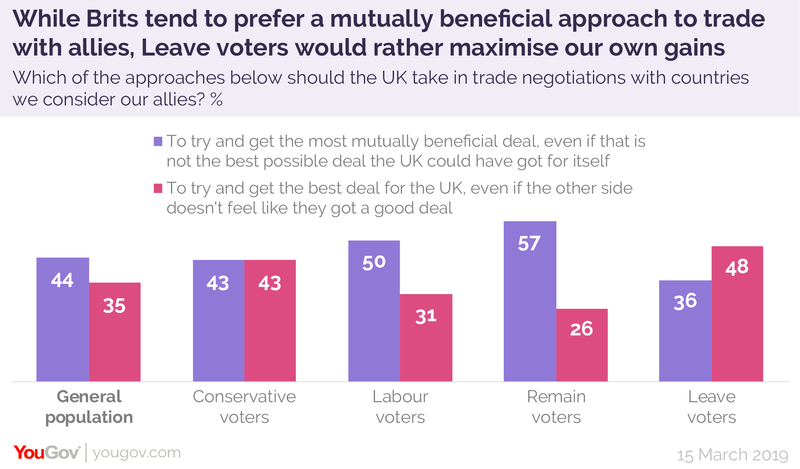 By contrast, Labour and Remain voters take a much more collaborative view of the matter, with the mutually beneficial approach being preferred by 50% to 31% and 57% to 26% respectively.